The Rockler Bench Cookies have been a hot hot item ever since they came out, so it is not that surprising to find out that Bench Dog is now selling them under their own name. Maybe in this case they should be called Dog Biscuits; only kidding. 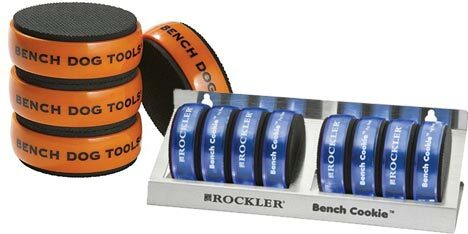 What this re-branding does for Rockler is allow their product to be sold in non Rockler stores. Smart move if you ask me. The only difference appears to be color, so the question is, do you want orange or blue? But what good are Bench Cookies without accessories. Accessories? Yup, how about a Bench Cookie Storage Rack. For just under $10 you can pick up a stainless steal storage rack that can hold up to 8 Bench Cookies. You can also buy a complete pack of 4 or 8 cookies including the storage rack. Now you will always know where your cookies are; that is if you can remember to put them away. If you are not interested in the storage rack, Rockler also has a 20oz glass mug set, and a Rockler t-shirt set... because your cookies need friends.